WHAT SHOULD I DO WITH MY PHOTOGRAPHS? MR. B. WILL EXPECT TO SEE SIGNIFICANT PROGRESS on staff's PRACTICE PAGES of their NEXT YEAR'S THEME PROJECT in yearbookavenue.com. Create these pages as PRACTICE PAGES, named LASTNAME_PAGE_SUBJECT. Please use actual titles and photographs from this year's book. Make sure to include to required pages elements such as captions, page numbers, design elements, etc. Our Bulletin Board needs to be done ASAP. Who is making our FLYERS? Did we put in an announcement? EMALEE, RINEY, HAILEY: You should be working on your supplement pages. Emalee- You have a bunch of away baseball game photos. See Mr. B. for their location. Mr. B. is back. We discuss and debrief to see how things are going. We have two and a half weeks to sell about SIXTY yearbooks. How can we do this? Did we pass out the BOOK CARDS while I was gone? We also need to be making progress on the SUPPLEMENT PAGES- Baseball, Track, Prom, etc. These are due ON FRIDAY! We also need to be making progress on the SUPPLEMENT PAGES- Baseball, Track, Prom, etc. These are due next week! ALL STAFF need to be working on creating the PRACTICE PAGES of their NEXT YEAR'S THEME PROJECT in yearbookavenue.com. Create these pages as PRACTICE PAGES, named LASTNAME_PAGE_SUBJECT. Please use actual titles and photographs from this year's book. Make sure to include to required pages elements such as captions, page numbers, design elements, etc. PLEASE NOTE: A few staff did NOT complete the Final Deadline Activity Form from the other day and/or did not send Mr. B. their Pencil Sketch of Next Year's Theme. This is really hurting your grade at the moment. Mr. B. tried to put in some grading for the Next Year's Theme Pencil Sketch, but only received a couple of these by email from staff members. The rest of the staff received failing grades on this. If you send me your pencil sketch by the end of class today, I will grade your work and put the updated grade in the book. (FROM ABOVE)- NEXT YEAR'S THEME PENCIL SKETCH: By today, you should have a completed pencil sketch of your proposed Yearbook Theme pages for next year's Yearbook. PLEASE take a photo of this sketch and email it to Mr. B. for grading. His email address is: pburkhard@weldre9.k12.co.us. You can use a phone or a class camera for this, as needed. I need to see these TODAY! ALL STAFF need to be working on creating the PRACTICE PAGES of their NEXT YEAR'S THEME PROJECT. Please use actual titles and photographs from this year's book. Make sure to include to required pages elements such as captions, page numbers, design elements, etc. GRADING #1- FINAL DEADLINE ACTIVITIES: Mr. B., because he has been out for so long, is falling WAY behind on his grading. To that end, Mr. B. needs to know what you have been working on while he has been gone. So that he can give you a GRADE for your recent work, please complete THE YEARBOOK FINAL DEADLINE ACTIVITY DOCUMENTATION FORM. You MUST provide as much detail as possible, as you will be graded on the work you have completed. PLEASE keep in mind that Mr. B. can check ALL PAGE HISTORIES and EDITS from yearbookavenue.com. If you indicate that you edited pages, I will be able to see if you did or did not do what you indicated! GRADING #2- NEXT YEAR'S THEME PENCIL SKETCH: By today, you should have a completed pencil sketch of your proposed Yearbook Theme pages for next year's Yearbook. PLEASE take a photo of this sketch and email it to Mr. B. for grading. His email address is: pburkhard@weldre9.k12.co.us. You can use a phone or a class camera for this, as needed. I need to see these TODAY! Be prepared to document what exactly you have been doing to help complete the Yearbook pages while Mr. B. was out. This will probably be a graded assignment. Have a pencil sketch of your proposed Yearbook Theme pages for next year's Yearbook. I expect to see this from all staff. Progress on the SUPPLEMENT PAGES, if you have been working on those in Mr. B. 's absence. We still need to be photographing SPORTS EVENTS, such as Track meets and Baseball games and putting together the pages for those in the SUPPLEMENT. We need to start working on our ideas for next year's theme. To that end, staff needs to review and begin work on the NEXT YEAR'S THEME PROJECT. If you do not have any other pages or elements to work on, please spend time today looking at LOOK BOOKS to find good Theme ideas and visual elements for your project. MR. B. IS OUT TODAY. He is recovering from his recent hospital stay and will be back at the start of the week after next. PLEASE WORK ON ANYTHING THAT YOU CAN TO BE HELPING COMPLETE OUR YEARBOOK. MAKE SURE WE ARE TAKING TRACK AND BASEBALL PHOTOS! MR. B. IS OUT VERY SICK TODAY. TODAY IS DEADLINE SIX. ALL PAGES OF OUR YEARBOOK ARE SUPPOSED TO BE READY TO SEND TO THE FACTORY BY MIDNIGHT TONIGHT. Mr. B. has spent hours and hours this break putting together as many pages as he could and sending them to the factory. As of this weekend, there are TWENTY PAGES that are missing content. A full TWELVE PAGES have NO CONTENT on them at all. We really need to pull together and get these pages made! Mr. B. has been extensive notes on each page, outlining what needs to be completed on the page. Please spend time today reviewing and COMPLETING these instructions on these pages! PLEASE GET SOME WORK DONE ON THESE PAGES TODAY! CLUBS: HOLA, TALENT SEARCH, CHESS, BIBLE meet this week. FFA AUCTION THIS WEEKEND. JV TRACK: @ District 6 on Wednesday- CIARA? DYLLAN: Please complete work on our BULLETIN BOARD, we need to put this up as advertising! All Teacher Pages up to Chrono Strip for 3/1, including Specials, Peterson, Rolfe, Lintner, Yaussi, Latuda, Gournoe, etc. PHOTOS OF THE WEEK ARE DUE TODAY: Please make sure that these are in the proper folder for grading. There were TWO photos assigned for this week. WE NEED DIVIDER PHOTOS! BASEBALL- Home opener tomorrow vs. Byers. JV TRACK: @ District 6 on Wednesday. Photo Opportunities for this week: CLUBS! SPRING SPORTS, BASKETBALL/FANS, DIVIDER PHOTOS (see below). Photo Opportunities for this week: CLUBS! First day of Spring Sports Practice TODAY, BASKETBALL, DIVIDER PHOTOS (see below), DRAMA and STEM FIELD TRIPS. WE NEED HELP COMPLETING OUR DIVIDER PHOTOS! Please get photos of the COMMONS AREA (looking from the gym to the front door), the RIOJAS/LOPEZ corner (photos taken from the hallway outside of Ms. Rich's Room) and the AG ROOM (see NATHAN for photo location). PHOTOS OF THE WEEK ARE DUE TODAY: Please make sure that these are in the proper folder for grading. WE REVIEW THE "NO FLY" LIST and the SUPPLEMENT. We review and discuss CLUB PAGES and PHOTOS. Photo Opportunities for this week: FFA WEEK, STATE WRESTLING TOURNAMENT, CLUBS PHOTOS! SORT OUT YOUR DAY IN THE LIFE PHOTOS! Properly name them, caption them and put them in the proper folder in the DAY IN THE LIFE folder. Work on Deadline FIVE pages! We need a volunteer to help with Senior Night Photography tonight, as Riney is out sick! We review DAY IN THE LIFE PHOTOGRAPHY DAY, which is TOMORROW! Make sure you know when you are getting a camera! Don't forget OUTBUILDINGS, such as Ms. Gournoe/Ms. White and the Media Center in your quest for photos! This is a large project for us and your participation will be graded. Here is the schedule for this project. PHOTOS OF THE WEEK ARE DUE TODAY FROM LAST WEEK! Please put your properly named and captioned photos into the proper folder before you leave today. Photo Opportunities for this week: FFA LEADERSHIP CONFERENCE, P/T Conferences, DAY IN THE LIFE, SENIOR NIGHT BASKETBALL ON TUESDAY, VALENTINE'S DAY, GBB @ LYONS ON THURSDAY, HS REGIONALS IN GRAND JUNCTION ON FRIDAY, CLUBS PHOTOS! SUPPLEMENT: We will be putting these 8 pages together soon, these include double pages for BASEBALL, TRACK, PROM and two single pages. Photo Opportunities for this week: MORP WEEK, MORP, Basketball HOME TUESDAY, Wrestling @ Brush on Thursday, Basketball @ Denver Christian FRIDAY. White/Lind: NEEDS CHRONO STRIPE COMPLETED. Fashion: PLEASE GET A FASHION QUOTE FROM CHARLIE ASAP! Photos of the Week are due today: Make sure that they are properly named, captioned and placed in the correct folder before you leave today. LATE WORK WILL NOT BE ACCEPTED. Roush/Sandstrom: Both have material, but need completion, including some photos of MS. ROUSH on her own page! Sandstrom page fonts are all wrong and we need a quote or something to help fill in the gray space around the Mr. Sandstrom mask. CHRONO NEEDS COMPLETION! White/Lind: White mask needs changing, lots of good material on thise pages, though. CHRONO NEEDS COMPLETION! Kaminsky/O'Brien: Lots of good information, although we need some more interesting music photos. Kaminsky mask needs touching up and the Art page has no mask. Work on this! CHRONO NEEDS COMPLETION! SIBLINGS/ANDY page are almost ready to go, they just need a final proofing. FASHION page: Also almost complete, just needs a final proofing. LUNCH/HOMECOMING DIVIDER: Almost ready, just needs final proofing. 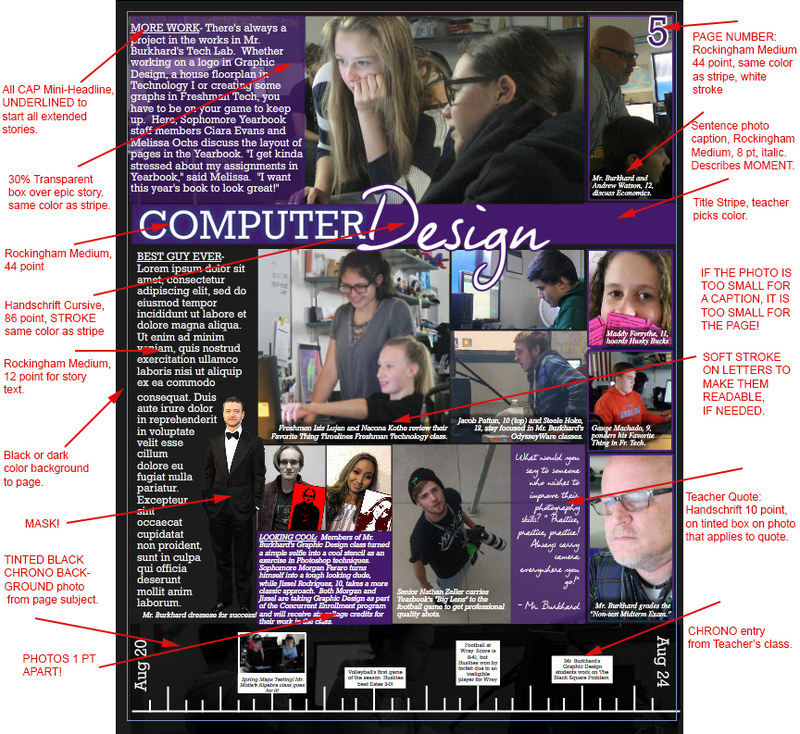 YEARBOOK PAGES: Needs some elements rearranged on the pages and a few more stories, then this will be ready to ship. ADS: We have two more pages of advertising to sell! We discuss DAY IN THE LIFE PHOTOGRAPHY DAY on 2/12/2019. This is a large project for us and your participation will be graded. Here is the schedule for this project. WEEKLY PHOTO ASSIGNMENTS WERE DUE YESTERDAY.